Shepherd was born in Shreveport, Louisiana. He graduated Caddo Magnet High School in Shreveport. The guitarist is "completely self taught", and does not read music. Growing up, Shepherd's father (Ken Shepherd) was a local radio personality and some-time concert promoter, and had a vast collection of music. Shepherd got his first "guitar" at the age of three or four, when his grandmother purchased a series of several plastic guitars for him with S&H Green Stamps, which Shepherd has said he would "go through like candy". Shepherd stated in a 2011 interview that he began playing guitar in earnest at age seven, about six months after meeting and being "pretty mesmerized" by Stevie Ray Vaughan, in June 1984, at one of his father's promoted concerts. His self-taught method employed a process of learning one note at a time, playing and rewinding cassette tapes, using "a cheap Yamaha wanna-be Stratocaster...made out of plywood, basically", and learning to play by following along with material from his father's record collection. At the age of 13, Shepherd was invited to play guitar onstage by blues musician Bryan Lee. He subsequently made demo tapes, and a video was shot at Shepherd's first performance at the Red River Revel Arts Festival in Shreveport. It was this video performance that impressed Giant Records chief Irving Azoff enough to sign Shepherd to a multiple album record deal. From 1995 on, Shepherd took seven singles into the Top 10, and holds the record for the longest-running album on the Billboard Blues Charts with Trouble Is.... In 1996, Shepherd began a longtime collaboration with vocalist Noah Hunt, who provided the vocals for Shepherd's signature song, "Blue on Black". Shepherd has been nominated for five Grammy Awards, and has received two Billboard Music Awards, two Blues Music Awards and two Orville H. Gibson Awards. 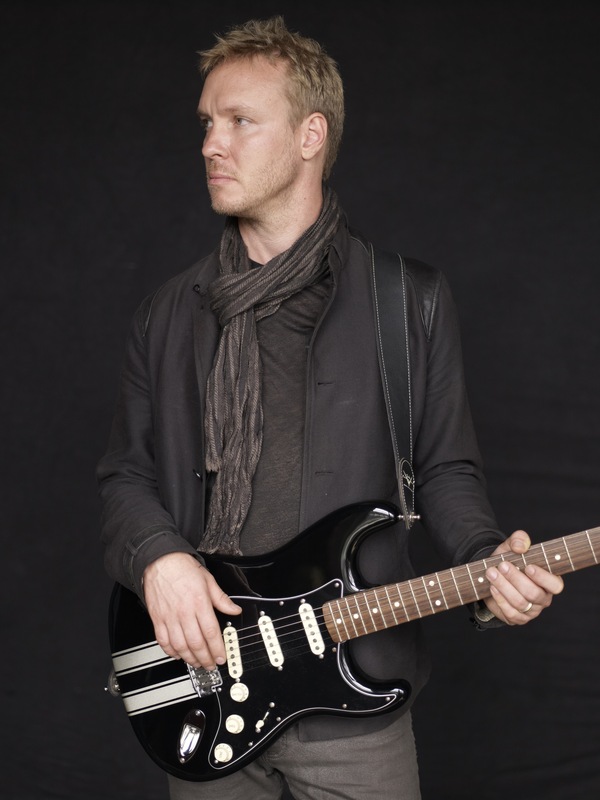 In September 2008, Fender Musical Instruments Corp. released the Kenny Wayne Shepherd Signature Series Stratocaster, designed exclusively by Shepherd. In 2007, he released a critically acclaimed and two timeGrammy nominated DVD–CD project, 10 Days Out: Blues from the Backroads. This documents Shepherd as he travels the country to jam with and interview the last of the authentic blues musicians. As they tour the backroads, Shepherd, with members of the Double Trouble Band, play with a host of blues greats includingClarence "Gatemouth" Brown and Bryan Lee, Buddy Flett (with whom he jams at Lead Belly's grave), B. B. King, blues harp master Jerry "Boogie" McCain, Cootie Stark, Neal Pattman, John Dee Holeman, Etta Baker, Henry Townsend with Honeyboy Edwards, and a concert session with the surviving members of Muddy Waters' andHowlin' Wolf's bands, including luminaries such as Hubert Sumlin, Willie "Big Eyes" Smith and Pinetop Perkins. In 2010 Shepherd was nominated for a Grammy for Live In Chicago which featured performances with Hubert Sumlin, Willie "Big Eyes" Smith, Buddy Flett and Bryan Lee. In 2011, Shepherd released his seventh CD entitled How I Go on Roadrunner Records.